Logitech has implemented their Lightspeed wireless technology in Logitech G703 and Logitech G603 gaming mice. With the Lightspeed technology, you can enjoy super-fast response time that is even better than the typical wired performance. Interesting, right? 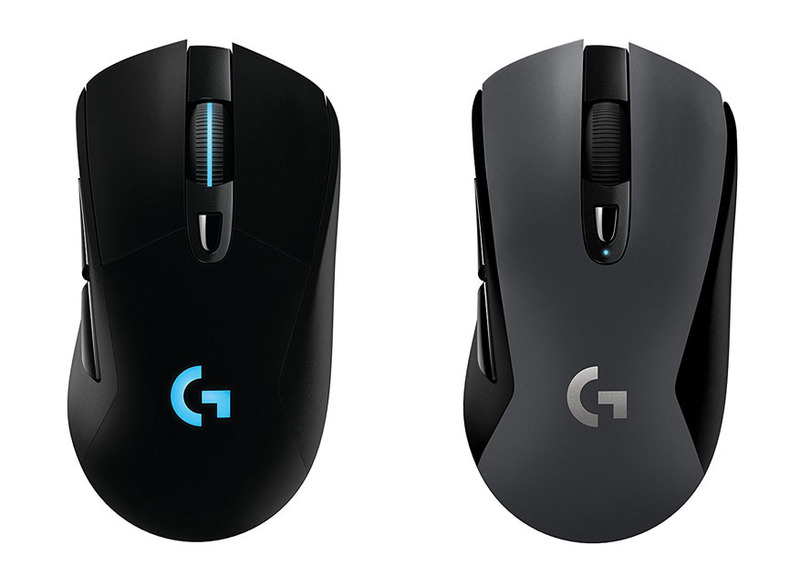 In this article, we will help you choose between Logitech G703 vs G603 by comparing them against each other. Logitech G603 and Logitech G703 actually have similar shapes. Both mice are ergonomic, designed for the right hand. Each of them has a total of six programmable buttons, with two large thumb buttons that are easily accessible on the left side. Both mice feel very comfortable. See also: Mionix Castor vs Logitech G502. However, Logitech G603 does not have the RGB backlight. The color is dark gray. On the other hand, Logitech G703 comes with the programmable RGB backlight. It is available in two color choices, black and white. So, you can choose your preferred color that matches your gaming setup. Logitech G603 and Logitech G703 are wireless gaming mice that are equipped with the Lightspeed wireless technology. This is an awesome technology. Traditional wireless connections are not really liked by competitive gamers because of the high latency levels. However, the Lightspeed technology boasts 1 ms response time, which is even faster than many wired mice. So, you will have a strong competitive edge with either mouse. Logitech G603 also has Bluetooth as an alternative option. You can use both Lightspeed and Bluetooth to connect to two devices simultaneously; simply switch between the devices by toggling a button. However, keep in mind that Logitech G603 doesn’t support one-the-fly DPI changing and button customization in the Bluetooth mode. On the other hand, Logitech G703 has a USB port as an alternative option. The USB connection also recharges the built-in battery. You can use the mouse while at the same time recharging the battery. Logitech G703 supports DPI changing and button customization in the Lightspeed mode as well as the USB mode. It is said that these two gaming mice use different optical sensors. Logitech G603 is armed with a new optical sensor called HERO (High Efficiency Rating Optical). On the other hand, Logitech G703 is armed with the famous PMW3366 optical sensor – this is considered as one of the best optical sensors for gaming. However, in various tests, Logitech G603 and Logitech G703 show very similar performance qualities. Both mice are very accurate and precise. They don’t have any smoothing, filtering, or hardware acceleration issue. Performance-wise, both are impressive gaming mice. Logitech G603 works with two AA batteries. Interestingly, you can actually use the mouse with just a single battery. The battery life is very good. It can last for about 500 hours in the gaming mode. However, you can’t recharge the mouse, so you will need to keep some spare batteries for backup. Logitech G703 has a rechargeable battery. You can recharge the battery using the USB connection. However, you can also use the Powerplay mouse pad for wireless charging. By using the Powerplay mouse pad, you can continue using the mouse in the wireless mode without running out of battery. Overall, Logitech G703 is indeed the winner. This mouse has better features. It supports DPI changing and button customization in all modes. Also, the rechargeable battery is very convenient. You can use the Powerplay mouse pad for wireless charging.